GET Imaging converts aperture cards into digital images. Our customers and industry use many different terms when describing the process of converting aperture cards into digital images, such as scanning, digitizing, imaging and computerizing apertures. At GET Imaging, we simply call it aperture card conversion services. GET Imaging converts our customers’ aperture cards into electronic images, creating digitized versions of the source filmed images. The computerized versions of the scanned aperture cards are commonly stored as TIFF, JPEG, or PDF files. When scanning aperture cards, GET Imaging typically creates (i) bitonal TIFF or PDF files or (ii) grayscale JPEG or PDF files. GET Imaging uses the industry’s best scanners and imaging software to enhance the digitized aperture card images. We read and report any punched Hollerith code. We automatically and manually apply indexes to the scanned images, creating digital documents. We perform quality control reviews to ensure customer satisfaction. GET Imaging delivers digital aperture cards on CD ROM disks, DVD disks, external hard drives, or via the Internet. Our customers can access the converted aperture cards from the delivery media or upload the scanned images to their document management system. Our customers access the imaged aperture cards online, eliminating the need to use or maintain aperture card reader printers or scanners. Many of customers destroy the physical copies of the aperture cards once the aperture card conversion project is completed. 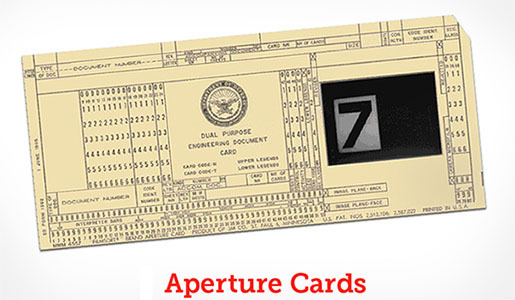 Why should you consider converting your aperture card records? Your digitized aperture cards will require little to no physical storage space, you can access the digital images online, and easily electronically backup the digital images. How much will it cost to convert your aperture cards? Prices are dependent upon factors associated specifically with your project. A list of factors is posted on the FAQ page of this website. Contact GET Imaging and we’ll discuss your project and provide you with ballpark pricing with no obligation. Let GET Imaging convert your aperture cards into digital ones, solving your storage, access, and redundancy problems. Send us a few sample aperture cards so we can show you what GET Imaging has been doing for decades… digitizing our customers’ aperture cards. Once we agree on a plan for your aperture card conversion project…send us your aperture cards; we’ll perform the conversion and deliver the digital results. It’s fast, affordable, and hassle-free, giving you the documents you need just a click away. Join the thousands of customers that trust GET Imaging with their aperture card conversions, and get back to what you do best. No project is too large or too small, so contact us today and GET Imaging!